With his white sand beaches and radiant sun all year long, the beauty surrounding Tamarindo will blow you away both above and below the sea. The small bay and islands just off the coast of Tamarindo provide at great habitat for schools of fish who call Costa Rica's Pacific coast home. Take a break from the surf and head out into the Pacific on your choice of one of our Tamarindo snorkeling tours. 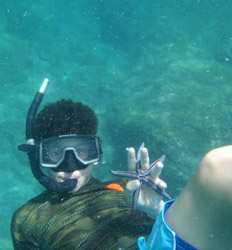 Snorkeling in Tamarindo is most fun when combined with other activities like our Tamarindo sea kayak & snorkel tour to Capitan Island. We also have snorkeling tours in Flamingo that will take you out to Isla Plata by kayak or by boat. If you prefer to spend more time on the boat and just get a taste of snorkeling in Tamarindo, your best bet would be to choose one of our boat tours instead. An abundace of colorful tropical fish, sea turtles, giant mantas and maybe even a white tipped shark are all waiting for you from any one of our Tamarindo Snorkeling excursions. So go ahead, grab your mask and fins and choose your favorite snorkeling tour in Tamarindo from the list below. Immerse yourself into the underwater beauty of Costa Rica's Pacific Ocean on one of our Tamarindo snorkeling tours. Our express snorkeling trip in Tamarindo provides incredible opportunities to encounter the vast bio-diversity of the ocean and its teeming wildlife in a short trip out into the local bay. 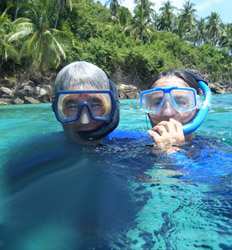 Tamarindo Snorkel Express deposit is $5.00 per person. This tour departs at 8:30 AM. If you looking for things to do in Tamarindo, our Tamarindo Kayak & Snorkeling to Captain Island tour is and activity you should add to your Costa Rica vacation bucket list! 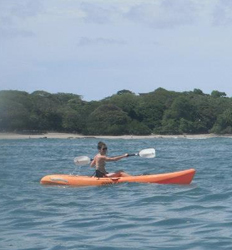 Captain Island Kayak & Snorkeling Tamarindo Group Tour deposit is $10.00 per person. Explore hidden bays and secluded beaches while discovering some of Costa Rica´s best snorkeling spots on our Flamingo Bay Snorkeling tour in Guanacaste. Flamingo Bay Snorkeling Tour deposit is $10.00 per person. Grab your own ocean kayak or share one with a friend and let´s head out to Guanacaste´s Flamingo Bay and explore the famous Catalina Islands and Isla Plata. Our Flamingo Sea Kayak & Snorkel tour is a small group tour so you will feel safe to snorkel & explore the secluded bays with our excellent guides by your side. So grab your paddles and book your ccean kayak to Isla Plata tour today! Flamingo Sea Kayak & Snorkel Isla Plata deposit is $10.00 per person.